The Shrine is at the site of one of the earliest European settlements west of the Mississippi. Although Spain controlled the area, early settlers here were French farmers and fur trappers attracted to the fertile banks of nearby Coldwater Creek. The French called the valley “Fleurissant” which means “flowering” or “flourishing” while the Spanish called the tiny settlement “St. Ferdinand.” While it is not known when the first settlers came to the area, it is believed that the village was settled about the same time St. Louis was (1764). The king of Spain actually granted the village the site where the old church was built. The settlement was typical of French settlements at the time with a commons and common fields where the villagers did their farming. Formal civil government came to the area in 1786 when Francois Dunegant served as civil and military commandant. A census held the next year indicated there were 40 people and seven plantations, according to Spanish archives. 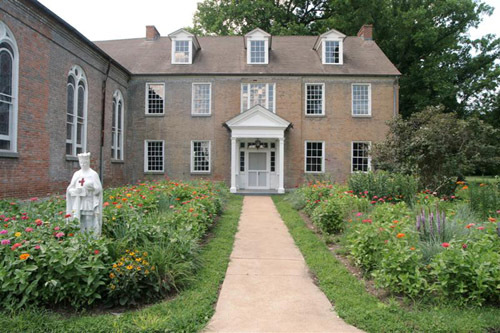 St. Rose Phillipine Duchesne, a member of the Religious Order of the Sacred Heart, an order which had been founded in 1800 in France, lived in the convent from 1819 to 1827 and from 1834 to 1840. In 1846 the Religious of Sacred Heart left St. Ferdinand and the following year the Sisters of Loretto were appointed to the parish. 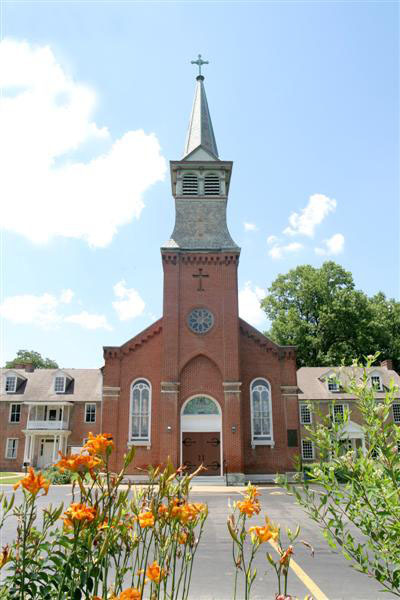 In 1880, the same year that the church was enlarged and a bell tower and altar was built, the nuns opened New Loretto Academy, a four-story brick building. In 1888 a parish school was built to educate the children of the growing parish. The school served the community for many years, however in 1957 with a soaring population, a new St. Ferdinand Church was built several miles away. The Archdiocese of St. Louis begin talks of tearing down the old church complex. However by 1958 a group was formed to save the complex. The Friends of Old St. Ferdinand was presented with a deed of the property from the Archdiocese for the cost of $1.00. In 1979 the complex was placed on the National Register of Historic Places and in 1988 with the canonization of St. Rose Philippine Duchesne it was designated Old St. Ferdinand Shrine by the Archdiocese of St. Louis. A fire in 1966 caused extensive damage to the rectory but a restoration was undertaken immediately. Another fire in 1976 destroyed a brick building at the rear of the church, which was the last of those erected by the Sisters of Loretto. 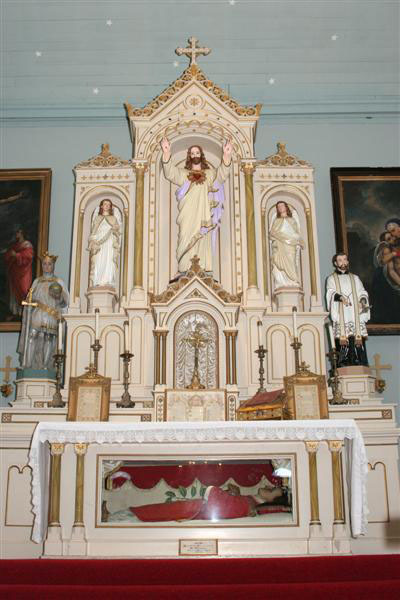 The Shrine is operated and maintained by the Friends of Old St. Ferdinand, a non-profit agency, 501(c)3. Old St. Ferdinand Shrine, with its wings, forms a group of buildings of unusual historical and architectural importance. It is the oldest Catholic Church west of the Mississippi in the upper Louisiana Purchase Territory. A replica of the original log church, built in 1790, is also on display in the rectory as is a collection of items from the early days of the village of St. Ferdinand, including silver religious items from the 1700s. While the oldest part of the church was built in 1821. The bell tower and steeple were added in 1883. They are painted a moss green, a shade extensive research indicates was the original color. 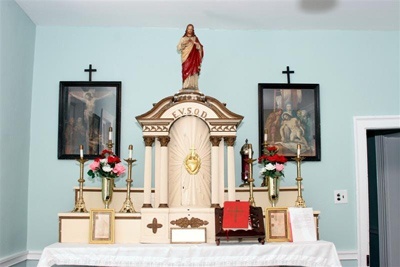 Relics of St. Valentine, thought to be a gift of the King of France to Bishop Louis DuBourg, are in a wax replica of St. Valentine below the altar. Exceptionally beautiful stained glass windows dating from the 1800s flank the main part of the church. The ceiling of the church is an unusual arch design uncovered when a dropped ceiling was removed during a restoration following a fire in 1966. Because of this unusual arch, the acoustics allow normal conversation to be heard in the rear of the church. Stencils on the ceiling were copied from the original design found when tin and canvas coverings were removed. Paintings on three 1960 wood panels on either side of the altar are thought to be from the school of Reuben. During the 1966 restoration, 17 coats of varnish were removed revealing pieces of Spanish moss in an early layer leading experts to theorize the pictures came from Europe and may have been brought up the Mississippi from New Orleans by Father DeSmet or Bishop Louis DuBourg. The crystal chandeliers hanging in the sanctuary were made by Landesman Galleries and were installed during the 1966 restoration. All of the buildings have been listed on the National Register of Historic Places, a cultural inventory of our nation’s irreplaceable resources, and form St. Ferdinand’s Shrine Historic District. Mother Duchesne came to the Florissant area from France and provided in her writing some of the best descriptions of early life in Missouri. St. Rose Philippine Duchesne, a member of the Religious of the Sacred Heart, an order which had been founded in 1800 in France, lived in the convent from 1819 to 1827 and from 1834 to 1840. Mother Duchesne came to the Florissant area from France and provided in her writing some of the best descriptions of early life in Missouri. In 1825 she established a school for Indian girls and later, when she moved to St. Louis, she ran a school for the children of wealthy St. Louisans. 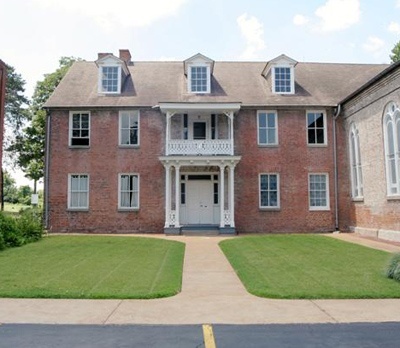 The school she founded in St. Charles, Missouri in 1818 was the first free school for girls west of the Mississippi. The Catholic Church beatified Mother Duchesne in 1940 as the fourth saint in the United States. She was canonized a saint July 3, 1988. Old South Wing of St. Ferdinand was built in 1810. It was originally used as a convent. It was here that Rose Philippine Duchesne stayed. The convent wing is one of the few brick buildings of this age and is almost in its original condition. It is considered one of the best examples in brick of the Federal style architecture in the state. A closet under the stairs in the hallway of the convent was used by Mother Duchesne as a makeshift bedroom. She reportedly slept on a straw mattress with a ragged blanket in the closet to be close to the chapel. A long upstairs room in the convent was used as a dormitory for the students. The third floor attic was the Novitiate and the linen room. The church’s original 1821 pews with very narrow seats are on display in the chapel area of the convent. The Rectory, which was added in 1840, is on the left as you approach the complex. On the first floor is a large room that was a chapel to the Blessed Mother when it was built in 1840. In the room is the cope worn by Father DeSmet. The cope was sewn for Father by Mother Duchesne. Also in the Rectory is the tabernacle from the original log church. The Rectory became home to the many priests who served the parish. Today the Rectory has information on these priests, an extensive collection of relics, and is the site of our Gift Shop and houses our Museum. The Museum displays many artifacts from early days. 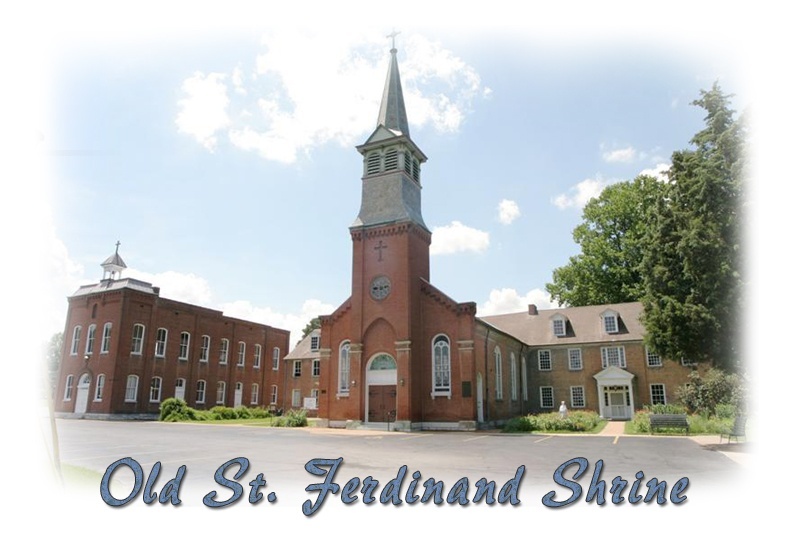 It is here you will be able to discover the rich history of St. Ferdinand Shrine. There are many photographs, timelines and artifacts which tell the story from the Shrine beginnings to the present time. Old St. Ferdinand Schoolhouse was built in 1888. The Schoolhouse once taught many students. The two floors were divided so different grades could be taught on each floor. Today the schoolhouse looks in much the same way as it did in the 1880’s. The second floor now houses a weekly Book Store and our famous Nun Doll collection.. The first floor may be rented for special occasions.